Entering the Rockies I felt the worse I've felt so far on the trip. Short doesn’t always mean sweet. Today was the shortest day of the trip at a mere 38k. But I wasn’t feeling great and the steep grade didn’t help as I slugged up towards the Rockies at my slowest speed yet. Even though the muscles in my legs actually feel fine I was in a sore achy pain from my mid back all the way to my feet (lethal combo of period pain, old back problems and many miles of uphill). The back of my left knee twinged uncomfortably as I hit hard on the pedals. The only relief from the pain was the gorgeous views: huge mountains all around peaked over the thick forests like chunks of frozen toblerone. Veins of melted snow tricked down the crevices in the mountain tops and reappeared as foaming creeks at the roadside. 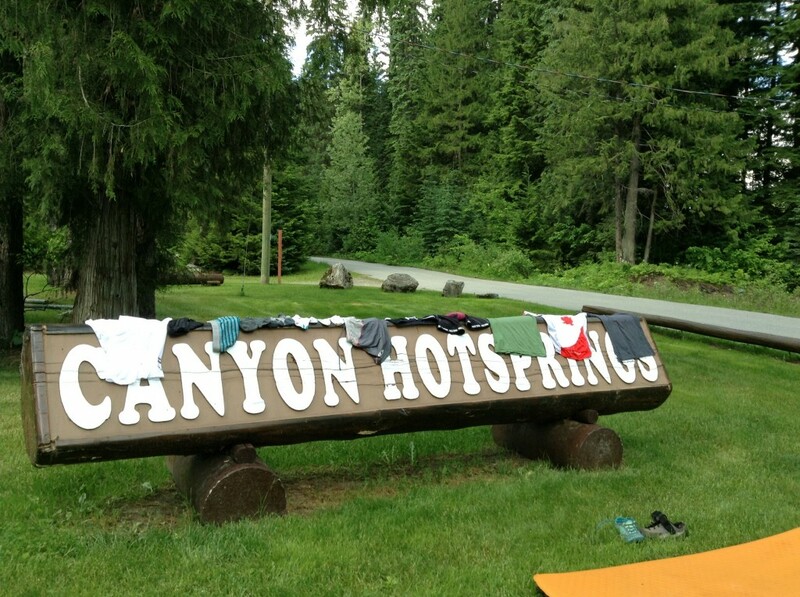 Today it was hot – almost too hot – as we ascended to Canyon Hot Springs. The campsite here is a bit of a joke. Everything is so expensive. After a hot days cycling I was annoyed to find that the showers were $3, especially having just forked out all my change to do some laundry. So in protest I decided to wash in a large sink (a talent I picked up in the good old days of cycling to college) and rather than spend $4 on a dryer I hung up my soggy socks and undies on the signpost. 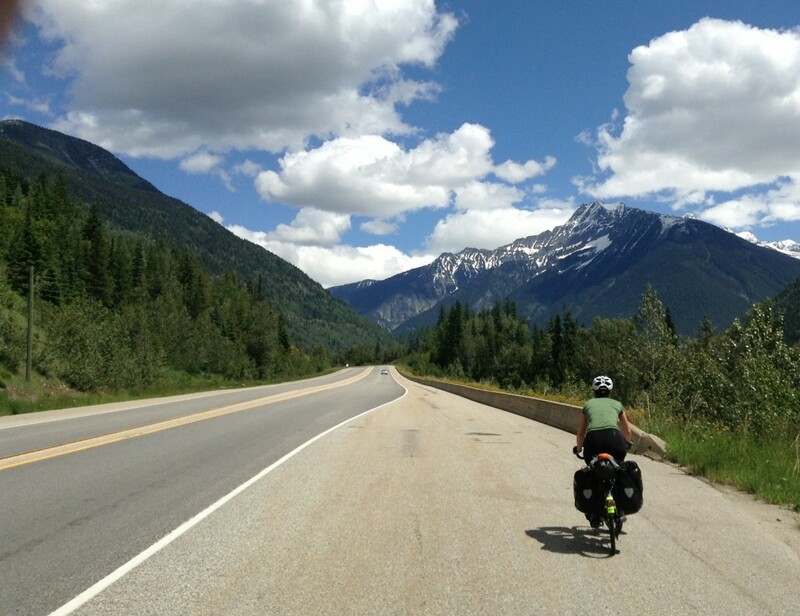 After popping painkillers today, feeling literally weak at the knees and the daunting summit of Rogers Pass on the horizon I am feeling a bit apprehensive about tomorrow’s ride. There are also some tunnels ahead on the way to Golden that other cyclists have reported as very scary. 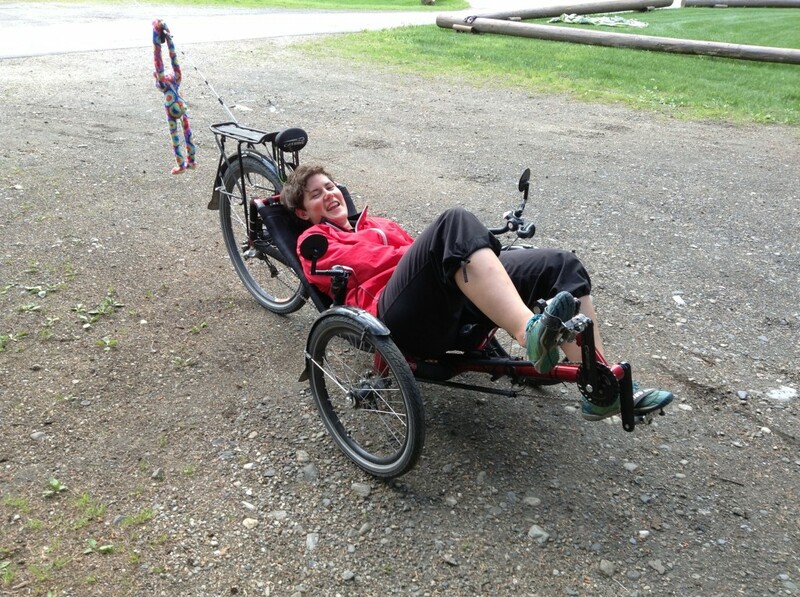 But who said cycling across Canada was going to be easy?! Worst bit of the day: watching Katie Wanderer slow-mo crash into a bed of poison oak. Ouch. That’s actually a neck rest above my head. I’m just that short.